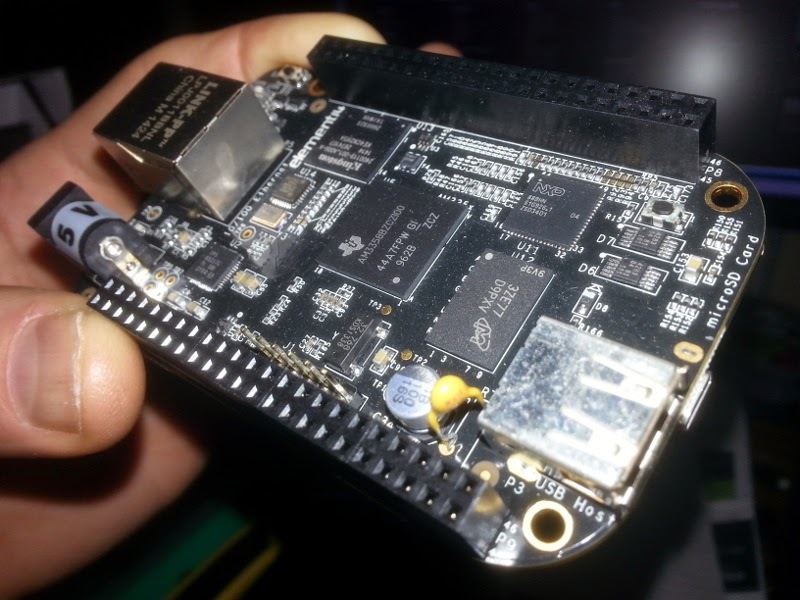 The BeagleBone Black is a tiny "computer on a board" similar to a Raspberry Pi. I bought on an experiment to see what I could do with it. 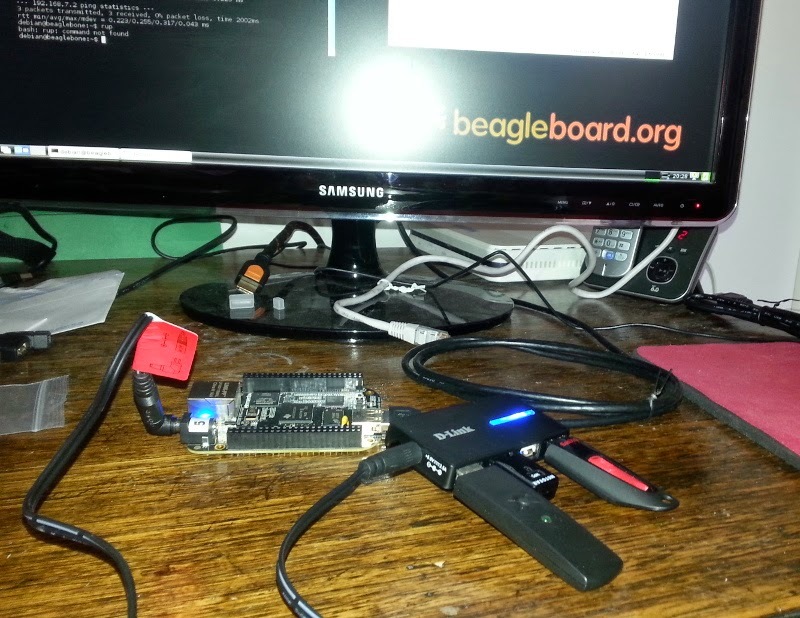 The BeagleBone wiki says to start off by connecting the BBB to a computer with the USB cable. So I plugged it in and it dutifully lit up. Browsing to http://192.168.7.2 showed me the BeagleBone 101 screen, which was a good sign. Then I plugged in the 5V power adapter, micro-HDMI cable, keyboard to the USB port and network cable to the RJ45. Booted into the default desktop (a Debian distro running LXDE by the looks). Next I tried the unpowered hub and hit the first issue: the single USB host port on the Bone doesn't have enough juice to run more than one device, which I'd kind of expected but hoped I might avoid. Hence the need to end up with a more expensive powered hub in order to run more than one USB device. Not a big deal, but when you consider that the BBB costs a lot more than the Raspberry Pi, which now comes with 4 USB ports (! ), it's somewhat disappointing. The desktop was usable but you definitely notice it's slower than a full-powered desktop computer. There are also occasional glitches, such as the print screen application blacking out particular some applications. I feel it's more suited to a low-powered always-on server type of application than for regular interactive use. Screenshot taken from the BBB shows some applications are "blacked out"
Get the Netgear 3100M working. Firmware didn't appear to be included in the distro, need to track it down and install it. Install the 8GB micro-SD card and make sure it works. So while it's a nifty little computer, I feel that it's definitely lacking when compared to the Pi. A friend has a Cubietruck, which has the nice feature of a host SATA port. Again, BBB comes up short in the price/feature matrix.